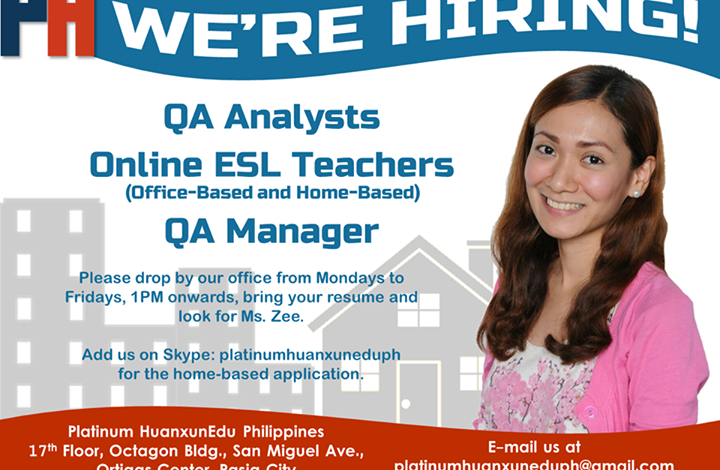 Platinum HuanxunEdu Philippines Looking for Online ESL Teachers (Home Based). Working schedule is from Mondays to Fridays/Saturdays. Working hours is from 7PM-10PM, fixed. Fixed hourly rate of $3.50 even if you don’t have class! Having ESL/TOEFL/TOEIC/IELTS/SAT teaching experience is an edge. 1. Click “Apply Now” and attach your resume. 2. Add us on Skype: platinumhuanxuneduph to have you scheduled for a demo class on your day and time of availability. * We will provide you the teaching material that you’re going to use. * We will send you short sample videos to help you prepare. * We will send you a link to a virtual classroom. * Demo class is for 25 minutes only. 3. We will send you your demo class result through e-mail. * If passed, you will proceed to the paid training session. To apply, visit their Facebook page, click on the Job Openings tab. 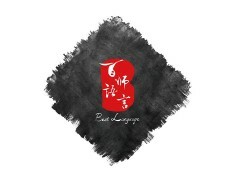 They are also looking for office based online ESL teachers. This entry was posted in Online English Teaching Jobs and tagged home based, home based english teaching job, home based english teaching jobs, home based jobs philippines, online english job, online english teaching job. Bookmark the permalink.